Download Fool’s Gold Live Studio Session From Seattle’s KEXP | True Endeavors Presents: music, tours, tickets, mp3 downloads, concert pictures, videos, Madison WI. I love these guys…they were so great when they opened for Edward Sharpe. Now I’m a complete sucker for Afropop, either the traditional King Sunny Ade variety or the indie variety ala Vampire Weekend or Fool’s Gold — and, yes, the question of appropriation of traditional art forms is a worthwhile, though unresolvable, debate. 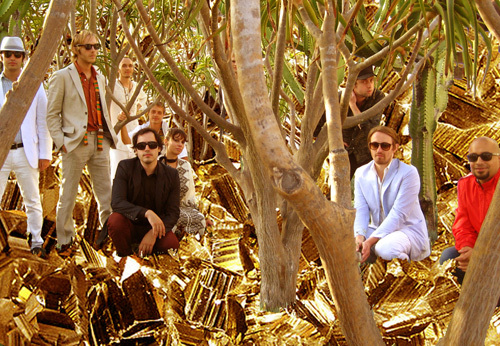 Fool’s Gold brings in a Middle Eastern vibe that blends really well with the taut pitched guitar lines of juju and soukous…and their shows are so infectious. So, should they come back sometime this year, maybe even this spring — and here’s hoping they do — be sure to check them out. They just might become your new favorite band.